Cian Dillon was one of the Clare stars in their relegation play off win over Dublin. Photograph by John Kelly. Both sides made changes before the throw in, Clare introducing Colm Galvin in place of Cathal Malone while Dublin called in Donal Burke and Caolan Conway in place of Eoghan Conroy and Cian Boland. A strong finish to the half which saw them outscore the home side, 0-7 to 0-2 helped Dublin to take a two point lead to half time when the score was 0-13 to 1-8. Clare had opened the scoring with a point from Aron Shanagher after just twelve seconds but Dublin hit the next four to open a three point lead. At the end of the opening quarter it was 0-4 to 0-3 in Dublin’s favour. 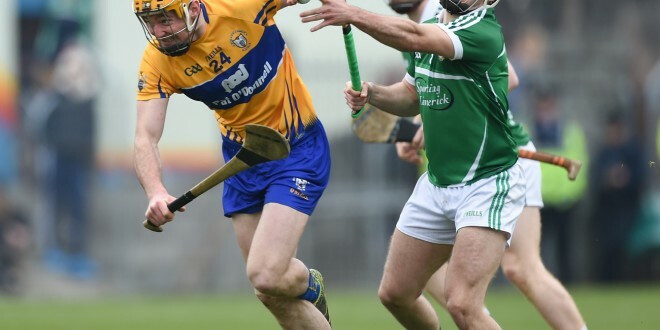 Clare went back in front in the twenty first minute when Aron Shanagher won possession from a long range free taken by goalkeeper Andrew Fahy and he blasted to the net. David Reidy pointed from a close in free and Clare led by a goal. Points fromTony Kelly, (2) David Reidy and Colm Galvin at the start of the second half were followed by a John Conlon goal and Clare had moved from being two points behind to five in front in as many minutes. The winners then went twelve minutes without a score but then Tony Kelly struck for their third goal and this killed off the Dublin challenge. The visitors moved Liam Rushe to their attack in an effort to get back into contention but the Clare defence held the upperhand.